I have converted rough texts of three Italian Medieval and Renaissance cookbooks into useful indexed and edited e-books (the universal PDF) that you can access to read, and to download, for free. The Toscano, Veneziano and Martino books are fun reads. They're written in an Italian that is a mix of Italian and Latin and sometimes French and Spanish. The local dialect and pronunciation is written phonetically. 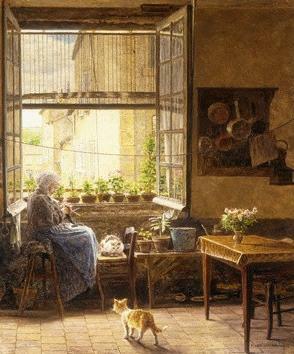 For example, in the Venetian cookbook, the soft Venetian pronunciation of 'gg' and 'ci' (for example: friggere, braccia) in Italian is written as 'z' and 'x' respectively (frizere, braxa). And the soft French ç is used to signify a soft pronunciation in a word like dolce, becoming dolçe (dolsay). It makes it easier to understand if you know any of these languages besides Italian. Try reading the words aloud phonetically, and listening to them. They often sound like modern Italian, but are just written with a different spelling. The spellings vary. The masculine and feminine of the words vary. And the words vary sometime even within one book. This is because languages were not yet categorized and documented by national governments and policed by language departments, and most importantly, each book was not the work of one author. It's best to think of the books as notebooks contributed to on loose sheets of parchments by visiting or permanent cooks in large feudal-style or manor house kitchens. 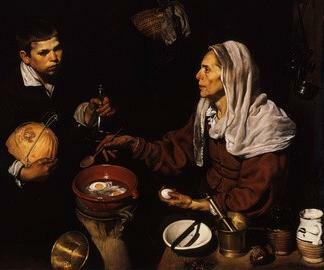 That's why most of the cookbooks are attributed to an 'Anonymous' cook from a general region of Italy, and they include instructions at the end of many recipes to 'now serve the dish to the Lord of the Manor' (da' al Signore). They were eventually gathered together, edited, and printed, resulting in these cookbooks. The regional distinctions of the anonymous authors really have little meaning. Each book cites recipes from other European regions and even from North Africa. Actually, many of the recipes have similar versions in North African cooking, and many of the ingredient names are bastardizations of North African words. This was not a time of the modern nation-state, but instead it was a feudal period that evolved into Prince-run-states, some enlightened by the Italian Renaissance (Rinaciamento). People, especially tradesmen like master chefs, were very mobile. Even Leonardo da Vinci offered his services to the chef of Ludovico di Sforza in Milan to make his banquets more exciting with pyrotechnics and robots. If you are interested in that story, here is a direct link to a book about it, at Amazon.com. Anonimo Toscano, Libro della cocina is the earliest (circa 1380) and briefest (23 pages) of the three books. The Italian is difficult to read if you only know Italian because the language used has lots of Spanish influence. 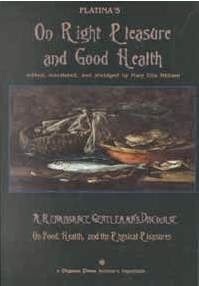 I have the e-book on my Italophiles.com website, Candida Martinelli's Italophile Site. 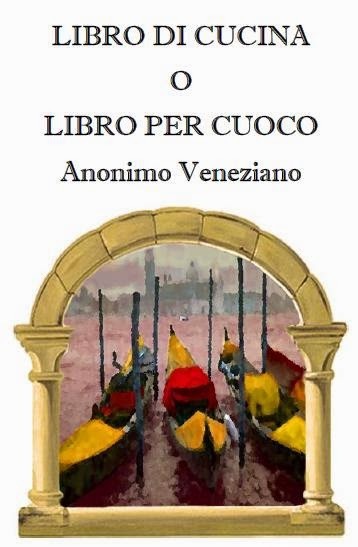 Anonimo Veneziano, Libro di cucina/ Libro per cuoco is from the Veneto area of Italy from circa 1430. 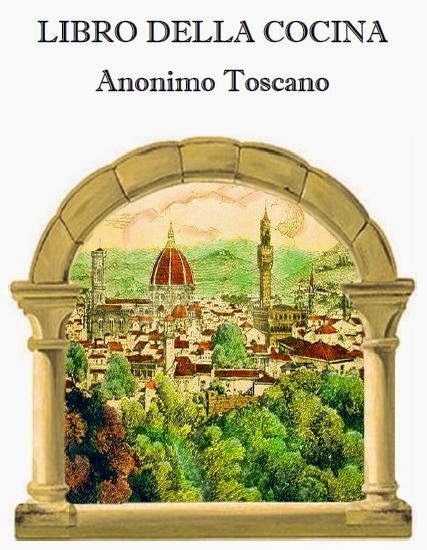 It is 29 pages long and incorporates many of the recipes from the Toscano book. The Italian is rich with French, Spanish and Latin influences, and transliterations of the Venetian dialect's soft consonant pronunciation. I have the e-book on my Italophiles.com website, Candida Martinelli's Italophile Site. 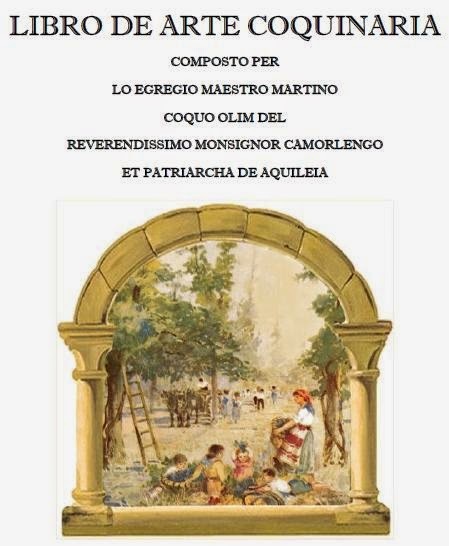 Maestro Martino de' Rossi, Libro de arte coquinaria is the latest book of these three (+/- 1460) and it incorporates much of the previous two books in it's 82 pages. It's divided into 6 chapters: meat, side dishes, sauces, pies/tarts, fried food and egg dishes, fish. The Italian is closest of the three books to modern Italian, with lots of Latin and Catalan mixed in. Martino was a chef to lord and popes. I have the e-book on my Italophiles.com website, Candida Martinelli's Italophiles Site. Martino's book makes up nearly half of the famous book by his friend Platina (Bartolomeo Sacchi - Humanist and Vatican librarian) Opera - De obsoniis ac de honesta voluptate et valitudine, from 1475, Opera On Right Pleasure and Good Health. 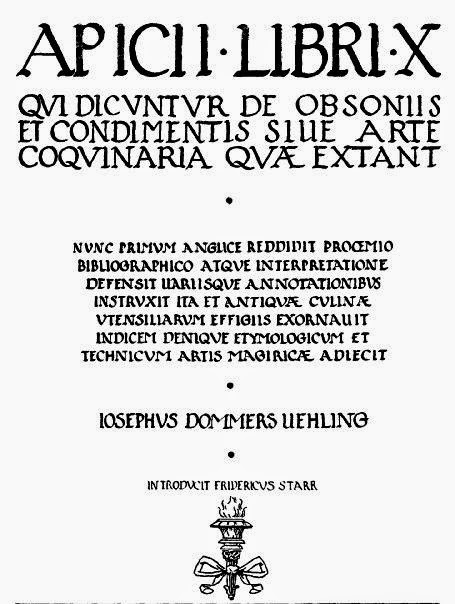 The French National Library offers an on-line scanned copy of Platina's book, in the original Latin. 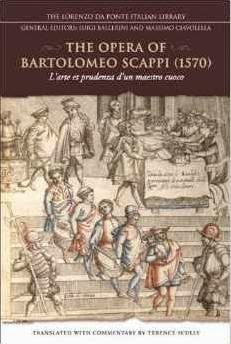 Later, in about 1550, a cook, Bartolomeo Scappi, put together another cookbook, which again incorporated many of Maestro Martino's recipes, re-written. The book was reprinted for over 100 years. Please visit my Italophiles.com, Candida Martinelli's Italophile Site, for more about the era these book were written in, the spices and herbs that were used then, pizza and pasta recipes in the books, quirks of the ingredients in the recipes, the common ingredients used, banquets, medicine, cooking tips and tricks, and links to more references on these subjects. 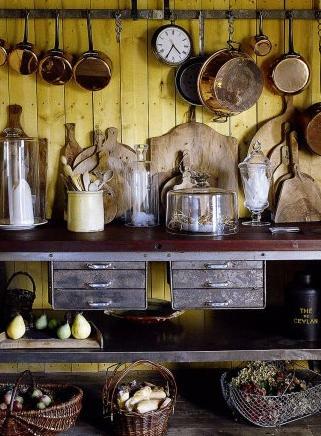 There are also lots more images, especially of medieval kitchens. 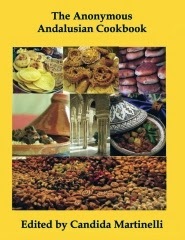 Al Andalus Cookbook, or the Anonymous Andalusían Cookbook is another free e-book I offer. Al Andalus Cookbook, or the Anonymous Andalusían Cookbook, was copied by a scribe in the 1400s, from texts from the 1200s, that often were themselves transcriptions of books from the 900s. I have a review of the book here on this site, which provides more information on the book and the recipes, which have direct links to Sicilian cooking, and indirect links to Italian cooking. You can download the e-book for free, or purchase, at cost, a paperback edition. The free PDF I created is my edit of the translated text, and hosted on my Italophiles.com site, Candida Martinelli's Italophile Site. 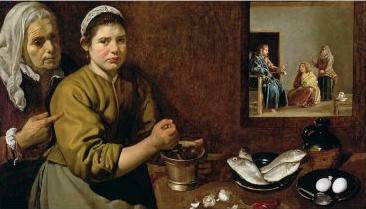 Apicius, Cookery and Dining in Imperial Rome is another free e-book I feature on this site. It is the only Ancient Roman cookbook we know, which is also the oldest European cookbook, and possibly the oldest cookbook in the world. Visit my review on this site for more about the free e-book of an English translation of Apicius's ten-chapter cookbook, with roughly 500 recipes. You can download the e-book for free from Project Gutenberg, the grand-daddy of free e-book websites.